Before the onset of beat groups the sharpest sound around in the UK was trad jazz. This was a highbred of traditional jazz but as post-war Britain entered a period of massive social change and upheaval the new music became the sound of a generation determined to enjoy itself. Key names emerged like Acker Bilk, Chris Barber, and Kenny Ball. All were consummate musicians who had mastered their individual instruments. Acker played clarinet, Chris was a trombone player, and Kenny Ball was a trumpet player extraordinaire. Whilst Kenny did not enjoy the pop success of the others, he was considered to be the most successful traditional jazz trumpet player in Britain. Born in 1930 in Ilford, Essex, Kenny started playing trumpet aged 15 and gained experience playing as a side man in the bands of Charlie Galbraith, Eric Delaney, and Sid Phillips. He met John Bennett his long time trombone player when they both were part of Terry Lightfoot’s band in 1956. Two years later Kenny had his own band and appeared at Albert Hall, London, at the Festival of Jazz. Tours and television followed before he signed a recording contract. More Dixieland than New Orleans Jazz, Kenny Ball and the Jazzmen could swing and Kenny could sing, so the band soon gathered an army of fans. Many were students turned onto jazz through the Campaign for Nuclear Disarmament (CND). These were the Moderns and later in the sixties become the Mods. Kenny was always a snappy dresser and wore Italian suits on stage cutting a dapper figure and role model for the early Mods. Kenny’s success was in the main because he was prepared to move away from the traditional repertoire and seek out tuneful songs from all sources. The sound was distinctive and soon Kenny and the boys made hit records that had mass appeal. The band had their first hit record, (I Love You) Samantha, in 1961. In the same year the Russians had beaten the USA in the space race and put Major Yuri Alexeyevich Gagarin into space, Kenny released Midnight in Moscow and it became a huge hit in the UK. The tune was recorded by the band and produced by a young producer called Tony Hatch. The recording shot up both the UK and US charts. In the years before the Beatles, Kenny Ball was a regular on BBC’s 'Saturday Club’; a radio program hosted by Brain Matthews and aimed at the teenage 'with it' population. It was like the 6.5 Special (UK) and the Six O’clock Show (Australia), only on the radio. There was even a film called Its Trad Dad (1962) starring Helen Shapiro and Craig Douglas. Helen was the Kylie Monogue of her day and Craig Douglas, well, a Sunday School version of Robbie Williams. Kenny and the Jazzmen played themselves on screen with a host of other Trad Jazz bands. The story was simple enough and about a couple of kids keen to get a Trad Jazz concert in their local town against a tirade of opposition from adult ‘squares’ (their parents). Same story format appeared with each new music craze but interesting to note how important the Trad Jazz was to the emerging UK scene to merit a film. They became the resident band on the Morecombe and Wise Show which only furthered their appeal. Two vocal highlights of the mid to late sixties was versions of Hello Dolly (1964) and the Beatles’ “When I’m 64”, (1967). His finally tally of hits was fourteen which ironically eclipsed his childhood hero of Louis Armstrong. 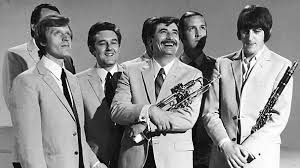 Even after their chart days came to an end, Kenny Ball and the Jazzmen continued to be popular through radio, television and live appearances. Apart from one short period, during which Kenny temporarily lost his 'lip' and found difficulty playing his trumpet, the band continued to thrive. In 1985 the band toured the Soviet Union to thunderous applause. In 2000, Kenny Ball and the Jazzmen toured Australia and New Zealand. The boys kept up a punishing booking schedule with an average 150 live gigs per year until Kenny’s health deteriorated in 2002. He rested and returned to recording and regularly appeared in sell out 'package' shows which featured Acker and his Paramount Jazz Band, Chris Barber, Humphrey Littleton, Terry Lightfoot or George Melly with their Bands. In 2013 Kenny Ball died aged 82 after a short illness.